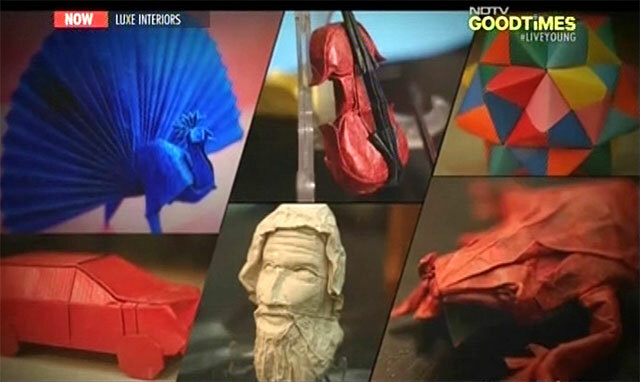 The good folks from NDTV GoodTimes came over to showcase Orukami on their show, Luxe Interiors (in its 3rd season now). 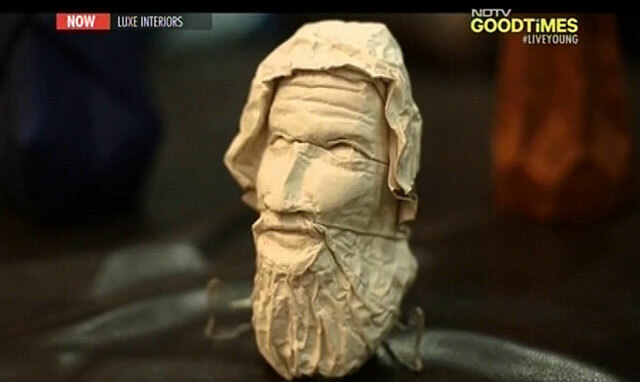 The show highlights unique trends in architecture and this week’s episode explored ‘geometry’ as a design element. Origami is based on geometry principles and it’s a lot of fun when you fold a model yourself. So, I designed an Origami Vase for the show’s DIY segment. Somehow, Origami is thought to be a kids’ activity and there is little awareness that Origami has vast artistic possibilities. So, to demonstrate that, I decided to decorate the room with varied Origami sculptures. I put up the Orukami Mask, Hagiwara Violin, Kamiya Frog, Oriland Vase, Kinoshita Vase, Lang SUV, Cabrino Kusudamas, Sonobe Modulars, Huffman Curved Objects, and Yoshizawa Peacock, among other models. The shoot went off smoothly. The camera crew was evidently very accomplished and it was a pleasant experience for all. I hope the show reaches many people and encourages some to take up Origami, maybe even use it in their homes. If you’d like to fold my Origami Vase, you can download the instructions here. Diagrams are hand-drawn by the very talented Origami artist from Poland, Blanka Pentela.